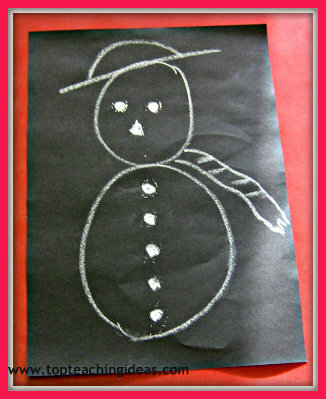 Snow theme activities for kindergarten kids. 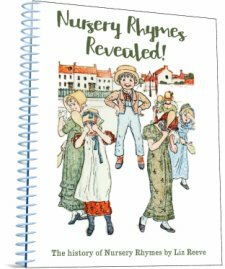 A Snow theme has loads of potential for introducing kids to activities that will motivate them as well as allowing them to explore their environment during the colder months of the year.So read on and have some fun! a sand/water container or something large enough or 3-4 kids to stand round at the same time. 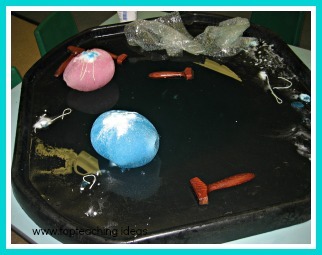 Firstly, pour a little of the food coloring into the base of the balloon and attach the neck onto the tap. Then SLOWLY fill the balloon with water until it is about 3/4 full. Tie the top securely and place it carefully in the freezer. It will need at least 8 hours or overnight to become solid. When you are ready to use it take it out of the freezer and peel the rubber off the balloon and now it's the kids turn! Allow them time to experiment with the ice balloon encouraging them to touch it, bash it, pick at it ,shine a torch onto it, use a magnifying glass to look at all those squiggles in it and when done----- allow them to pour some salt onto it and watch what happens! When they have all had a turn and are beginning to get a bit bored with the whole thing take it outside and let them play football with it! Snow theme fun! I did this snow theme activity after we had all been outside in the snow, dressed in our hats, scarves and wellies and made a ginormous snowman! Once inside I gave the kids a piece of black paper and a white crayon and asked them to draw a picture of the snowman we had made outside. We talked about the shape they would need to draw for his body and for his head and whether they thought a snowman ought to have a scarf and a hat to keep him warm? One little girl asked if she could draw a snow lady! When they had drawn their snow people I gave them some cotton wool and glue as well as pieces of material, and asked them to dress their snow person. We got great results. 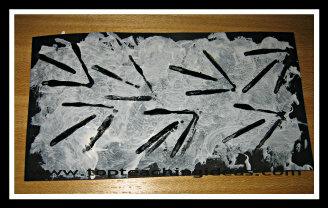 This activity can make a great display for the winter or you can do lots of smaller pictures for the kids to take home. Before you start some preparation is needed! quite a few used matchsticks. some tubs, big enough to dip the blocks of wood in. First stick 3 matchsticks in the shape of an arrow [or a birds foot] on one side of the block and allow to dry completely. 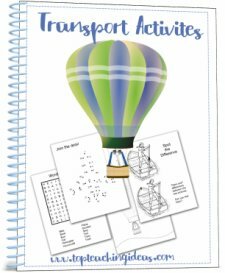 If you are a teacher you will probably need several of these so the kids don't have to hang around waiting for their turn. Next you need to pour a little black paint into each of the tubs and when the matchsticks are dry the kids can dip their block into the paint and make a path of bird prints all over their paper. They might like to draw a nice juicy worm at the end of their trail! 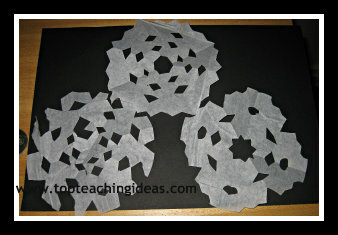 A well loved addition to your snow theme activities for helping children with their cutting skills. All you need is white tissue paper and scissors plus a little help from you or their friends! 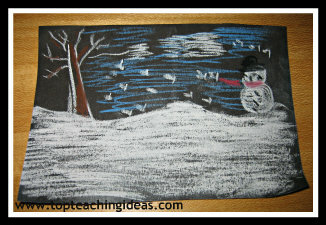 This simple activity uses chalk on black paper to make impressive winter scenes. If you're lucky enough to have some snow while doing this topic with the kids ,they can go and look for themselves and find a scene they would like to try and draw.When I display them I have sometimes put a photo next to the drawing so they can compare the different mediums.